Stephen Merchant is probably best known as the co-creator of The Office, the voice of Wheatley in Portal 2, and the comically awkward star of HBO’s Hello Ladies, but through all of those projects he was rarely afforded any opportunities to showcase what a totally awesome badass he is. Thankfully, Deadline is reporting that Merchant has joined the cast of 20th Century Fox’s Wolverine 3, so he’ll definitely get a chance to beat up some dudes and do other cool stuff in that movie. Merchant will be appearing alongside Hugh Jackman, Narcos’ Boyd Holbrook, and the recently cast Richard E. Grant in the film, which might end up being based on the “Old Man Logan” storyline. Unfortunately, Deadline doesn’t say which super-cool X-Man Merchant will be playing (or if he’ll be playing an X-Man at all), but considering that most of the famous mutants are already played by other people, it’s surprisingly easy to narrow down which ones haven’t been in movies yet. He could be playing Doop, the flying green potato thing, or he could be Northstar, a Canadian guy who can fly and stuff, or he might even be X-23, the teen girl clone of Wolverine. Those characters don’t really capture Merchant’s gruff demeanor or intimidating physical presence, though, so we’d wager that he’ll be playing Cable, the time-traveling son of Cyclops and Jean Grey (sort of). 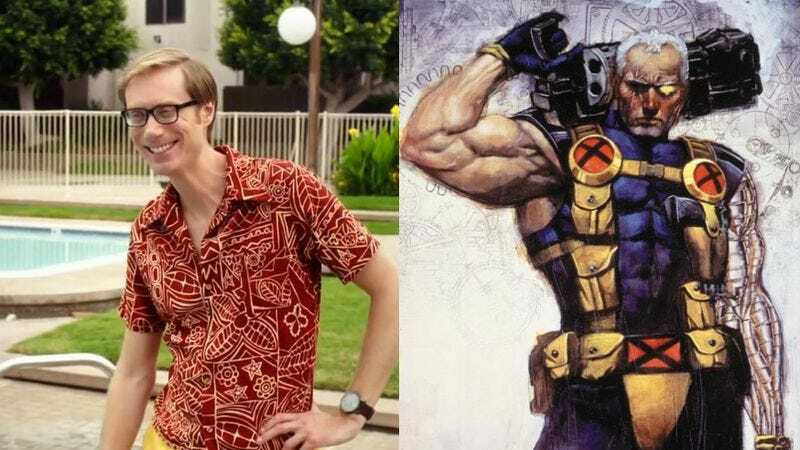 He’s got white hair, a metal arm, and he usually carries ridiculously huge guns, so Stephen Merchant would be basically perfect.